The first time I saw “A Christmas Carol,” the musical adaptation by composer Alan Menken and lyricist Lynn Ahrens, was last year. I knew then, as many already did, that it would be something I would want to see again and again and again. Music Mountain Theatre does a great job with this classic. The story is one we all know. A good friend of mine has read the novella every year as part of his holiday tradition. The book by Charles Dickens was first published in 1843 by Chapman and Hall, a London publisher for whom I worked for several years in New York City. It was successful from the get-go. The first edition was published on Dec. 19, and sold out by Christmas Eve. It was that very popularity that might make you wonder what could be better than the book or one of the many movie adaptations starring everyone from Alistair Sim to George C Scott to Bill Murray. Another musical retelling seemed unnecessary. We already had a singing Albert Finney and Mr. Magoo. So, with a glut of Scrooges, I was delighted when I went to see this show and discovered how this stage version captured the essence of the season anew for me. The story is a winner, but because it is well known, it is the acting by the leads, in particular Scrooge, that lures you back. I mentioned to a colleague before going to see the show that I hoped that David Whiteman would play the lead again, and he does. Whiteman is at the top of his game, and creates a complete, fully-realized, honest-to-goodness curmudgeon — a totally believable Ebenezer. I wanted to see his performance, as it would be hard to envision anyone better. Like Yul Brynner was made to play the King in “The King and I,” Whiteman’s lanky frame and sour demeanor with glimpses of vulnerability help him to embody this role like no other. The songs are charming, but there are a handful whose melodies linger. “Link by Link,” with catchy lyrics and a building crescendo, is one of them. Alex Klein as Jacob Marley does it justice. He has an incredible, pitch-perfect voice. 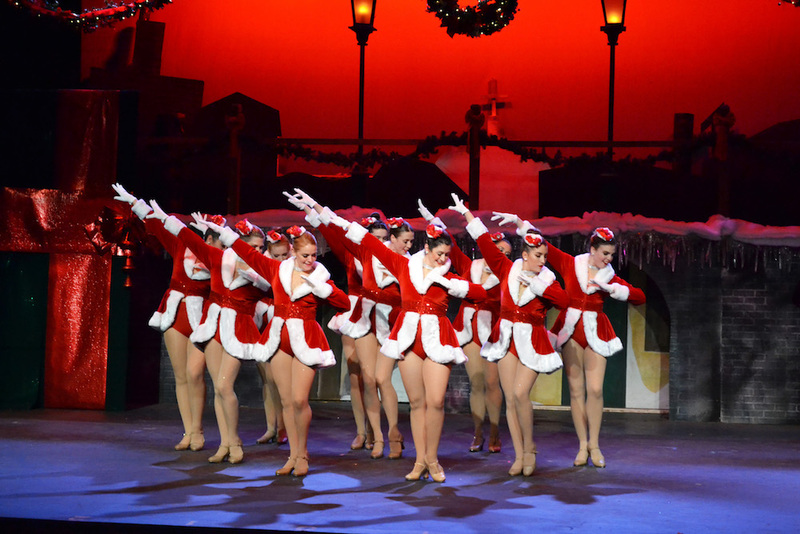 And the number was complemented by the choreography of Louis Palena and Jordan Brennan, who are also the directors. In contrast, there is the simple song that is so honest and true: “A Place Called Home.” This is sung by Ebenezer when he was age 12 by Aidan McLendon. He sings with such honesty and simple vulnerability that he charms an entire audience. The ghosts all give lively performances. Jill Palena as the Ghost of Christmas Past is glitter and joy, David McCloughan, Jr. as the Ghost of Christmas Present bubbles with enthusiasm over the current opportunities of “good will toward men,” and Ali McMullen and Sharon Rudda as the Ghosts of Christmas Future portend a possibly bleak future with malevolent artistry. 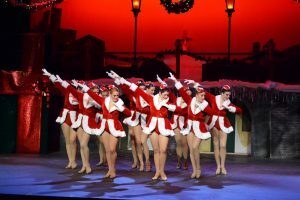 On the dance front, we have ballroom dancing at Fezziwig’s Annual Christmas Ball, tap dance with Christmas Present, and free style and ballet when looking toward the future. The choreography is so fun and creative. It effectively sticks in your head, joyfully in the case of the song “Abundance and Charity,” with a Rockettes-style tap and chorus line, or the effective song “Dancing on Your Grave,” that segues into a frightening freestyle dance, and then a ballet by the splendid Sharon Rudda. Special mention to the fine acting/singing of the Fezziwig family, which is actually the Honan family of Eddie Honan Jr (Mr. Fezziwig) and Libby Honan (Mrs. Fezziwig). Also to the Cratchit family headed by Bob Cratchit (Louis Palena) and his wife Martha (Lauren Brader) , who are excellent showing the dire straits that average people were facing at that time, which was one of the points Dickens was making in the original material. The Menken/Ahrens “A Christmas Carol” should be a must see this season, as it exemplifies the meaning of Christmas. Community at its heart is what Dicken’s tale is all about and, quite frankly, it is what Music Mountain Theatre is all about. Both this production and its producers are blessings that we are lucky to have. 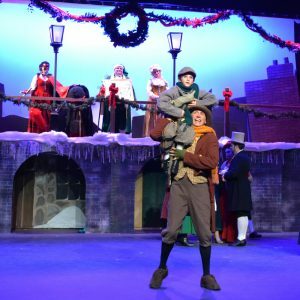 “A Christmas Carol” runs through Dec. 16 at Music Mountain Theatre. As an aside, in regards to community, Ginny Brennan, Founding Director of Music Mountain Theatre is being recognized by the Greater New Hope Chamber of Commerce with a Community Achievement Award for her contribution to theater education in our area, where theater has meant so much to our area’s history and business. You are what you do, and our towns have been doing noteworthy theater for generations. In gratitude, the chamber is presenting this award to Ginny Brennan at their holiday party at Havana’s on Monday, Dec. 10, 6:30-9 p.m.